Designed for heavy cover yet suitable for all conditions. AbrazX can be used in both Spinning Reels and Bait Casting Reels. The line has exceptional knot and impact strength and is extremely soft and sensitive for better feel and smoother casting. 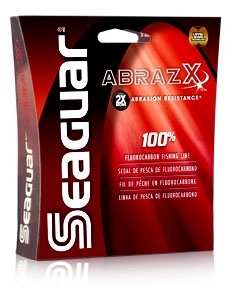 As with all 100% Fluorocarbon products, AbrazX is much less visible underwater than monofilament line and virtually invisible to fish. The line is also UV resistant, chemical resistant, non-absorbant, high-density and impervious to cold conditions.